More than 200 public health and medical experts have a message for Congress: SNAP is one of this country’s most effective programs for helping people in both rural and urban communities. Congress should preserve SNAP by approving the Senate version of the Farm Bill. Find out more and read the expert letter (PDF). As the 2018 farm bill makes its way through Congress, the Supplemental Nutrition Assistance Program (SNAP) has been a key point of contention. 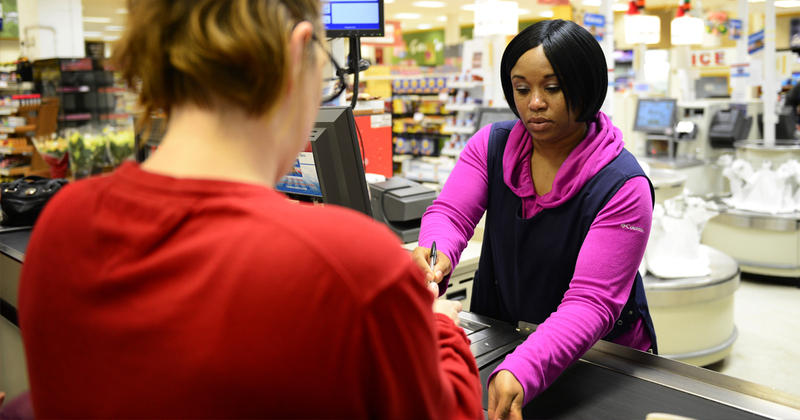 The initial House version of the bill included proposals for stricter SNAP work requirements that would have reduced or eliminated benefits for millions of people. That version was defeated, but as of early August 2018, it was still unclear how SNAP would fare in the final bill. Such legislative attacks are rooted in persistent, divisive myths about the program. In fact, there's plenty of evidence showing that SNAP is a solid investment, a cost-effective program that benefits not only participating families but entire communities. And since SNAP's benefits cut across demographic and geographic lines, it's a program the country should be able to unite around. The largest nutrition safety net in the federal budget, SNAP is the first line of defense against hunger and food insecurity for more than 21 million American households. In 2016, the program lifted more than 3.5 million people out of poverty—nearly half of them children—and reduced food insecurity rates by up to 30 percent. These positive effects on the health and well-being of participating families testify to the program's value. But SNAP's benefits don't stop there. SNAP's benefits reverberate across the entire nation, touching people of every age, race, zip code, and political persuasion. 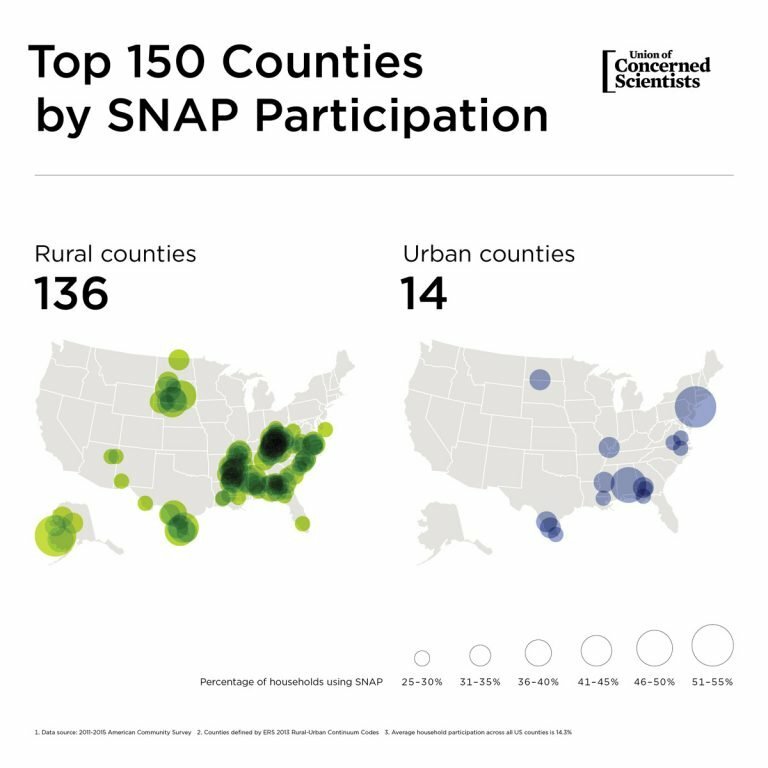 A recent UCS analysis shows that SNAP plays an especially vital role in the economic health of rural areas: 136 of the 150 US counties with the highest rates of SNAP participation are defined by the USDA as rural. SNAP not only helps participating families keep food on the table; it also creates room in household budgets for other necessities—such as housing, utilities, transportation and health care—further broadening the economic reach of the program. This means that SNAP's economic benefits aren't confined to the food industry, either. They're felt across a wide range of economic sectors, from energy to manufacturing. By improving the standard of living for millions of people, SNAP provides a vitally important economic boost, supporting hundreds of thousands of jobs. And because SNAP participation is highest in low-income areas, these positive economic impacts are reaching the communities where they're needed most. Our analysis also found that less than ten percent of SNAP participants in rural areas are able-bodied adults without dependents. As with urban participants, the vast majority are children, caregivers, seniors, or adults with disabilities. We know that SNAP is a smart investment in the health and well-being of families, communities, and our economy. 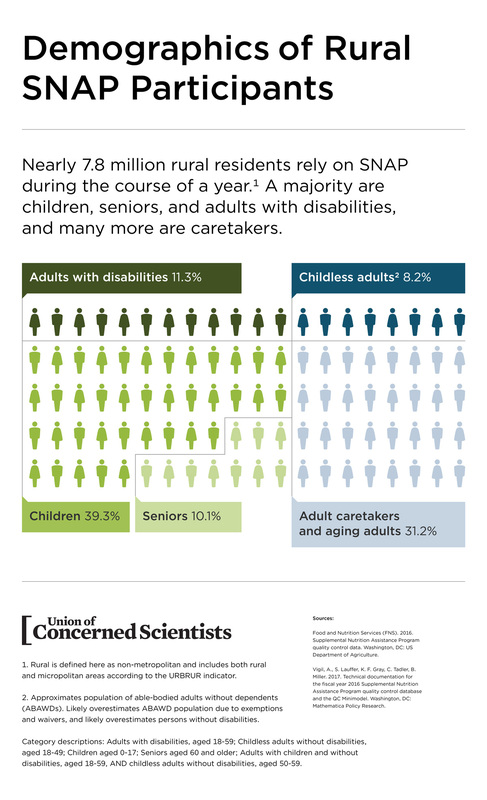 Efforts to weaken the program in Congress make no sense—especially when you consider that many proponents of these anti-SNAP provisions represent areas with higher than average SNAP participation. The Food Insecurity and Nutrition Initiative program (FINI) helps to incentivize the purchase of fresh, local produce with SNAP dollars. The Healthy Food Financing Initiative (HFFI) offers grants and loans to help establish locally-owned healthy food retail outlets in low-access areas. The Local Agriculture Market Program (LAMP) invests in local and regional food infrastructure, including farmers markets, food hubs, and co-ops. Tell the leaders of the farm bill negotations that you support a farm bill that will keep SNAP strong.